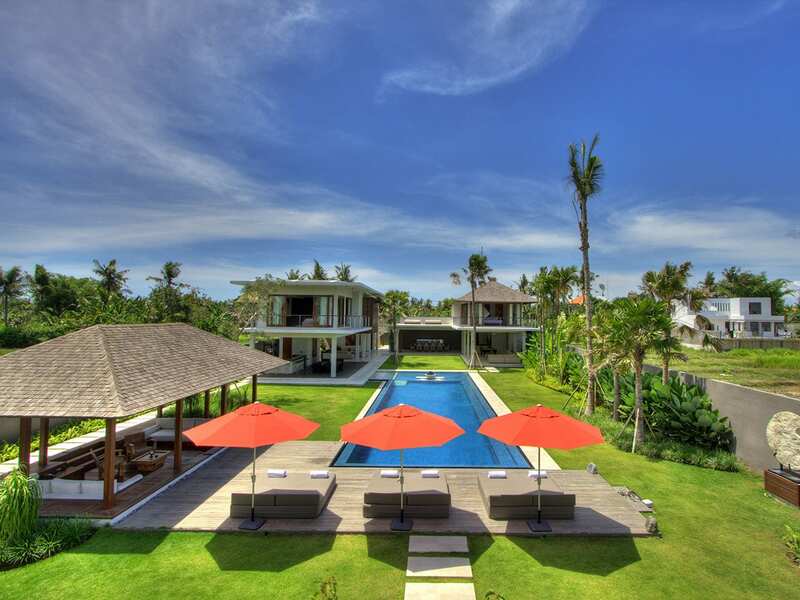 Set in a lush garden just steps from Canggu Beach (which is renowned for its surfing and spectacular sunsets), Villa Kavya is a spacious and modern 4-bedroom luxury hideaway, perfect for families or a group of friends looking for a relaxing getaway. 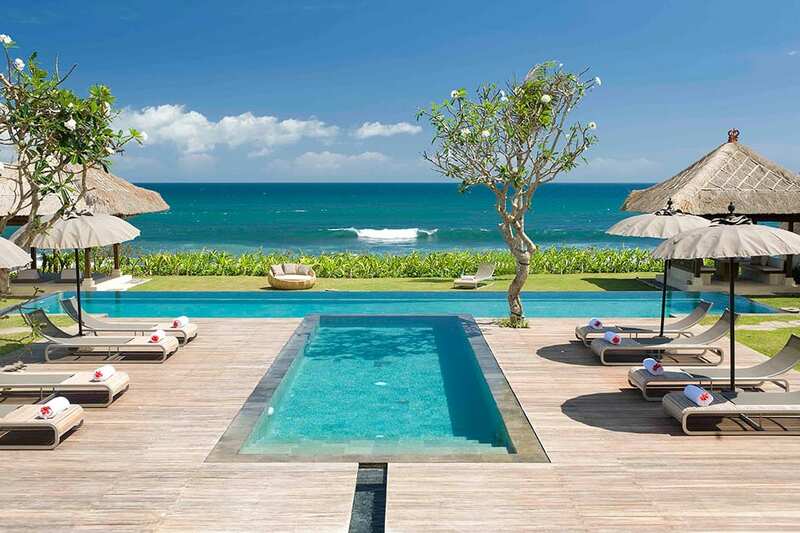 The ambiance is warm and welcoming, the decor is sleek and stylish, and you’re close to everything the south of Bali has to offer, including fabulous shops, restaurants and bars, windswept beaches, golf courses and temples. 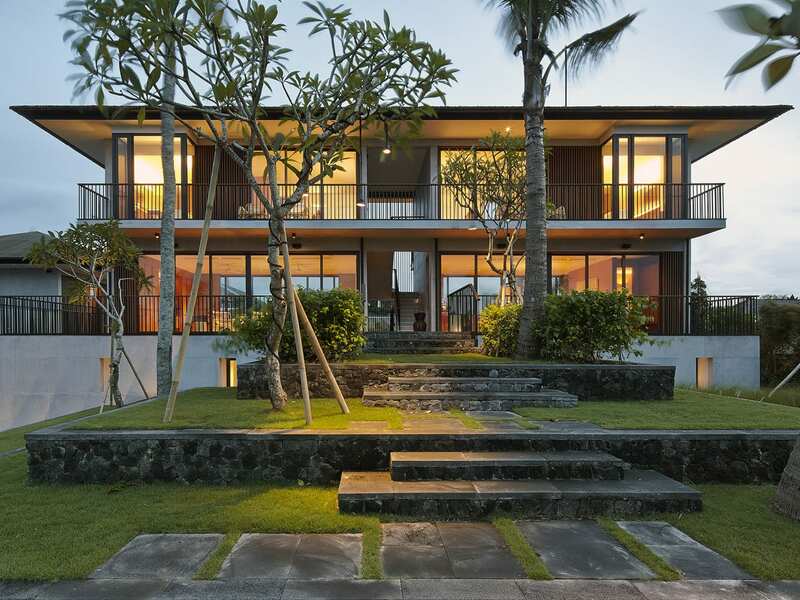 The renowned Indonesian architect, Sekar designed the villa with a modern take on the traditional Balinese concept of open spaces and communal living. 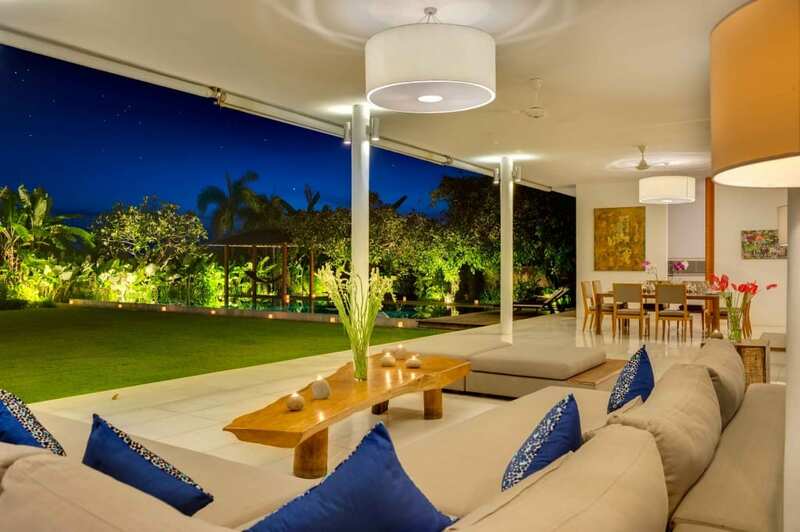 The breezy living and dining area is open-sided and has French doors that allow light and air to spill in. 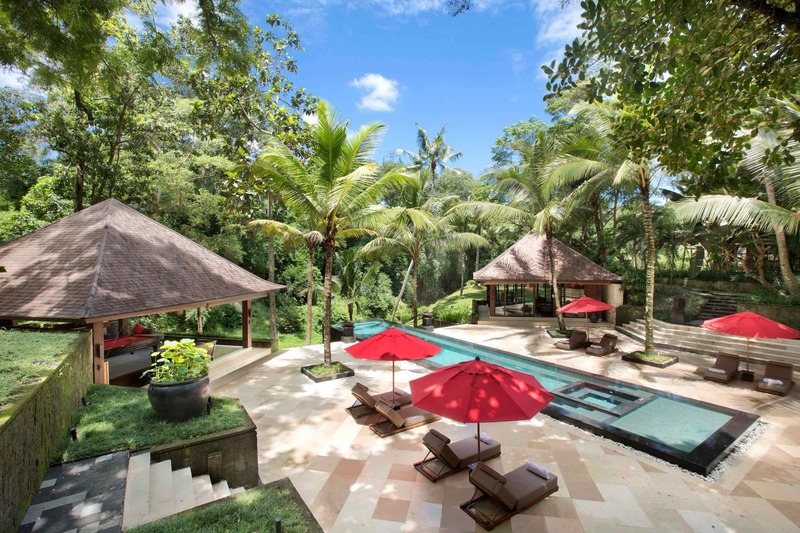 Sit back and relax on one of the cosy couches in the open-air lounge, or spend the day lazing by the pool surrounded by expansive emerald green lawn, and meet up for gourmet lunches and dinners at the long wooden dining room table. At night, you can retire to the air-conditioned TV room for movies and music before heading off to bed in one of the spacious and private bedrooms. 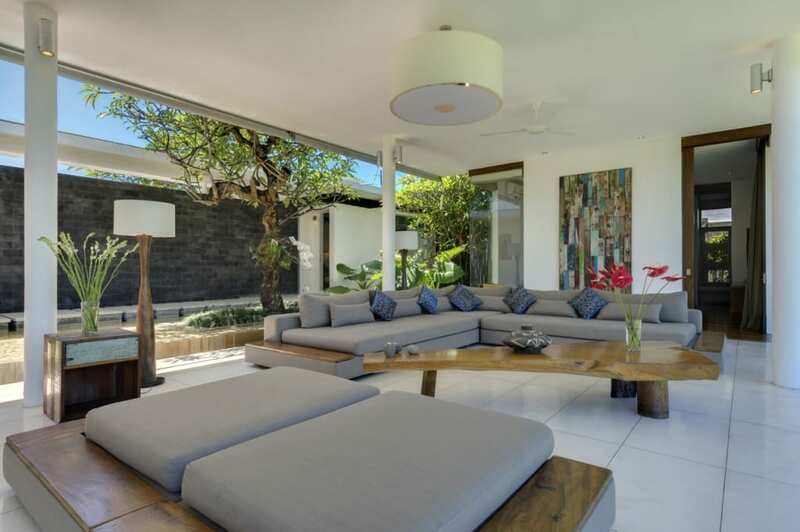 The living and dining area offers contemporary class with clean white walls, warm teak wood floors and creamy granite floors offset by bursts of colourful tropical flowers. 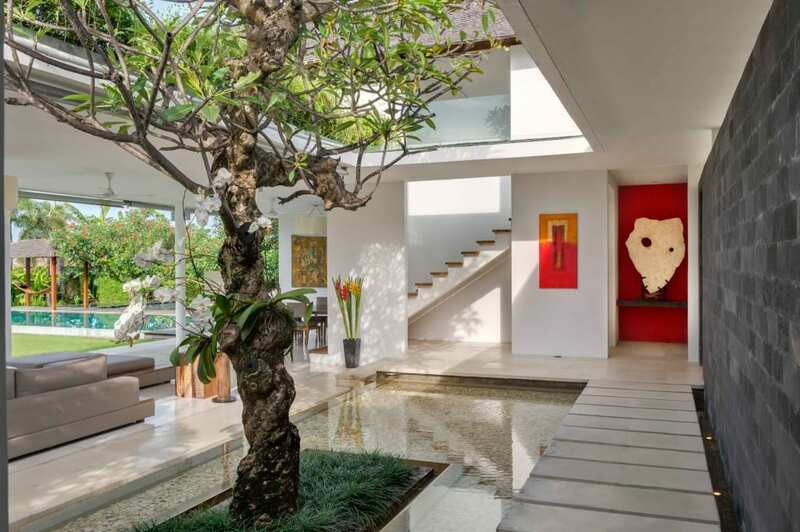 One side of the living area opens to a tranquil water feature, and the other side boasts a beautiful garden. The long L-shaped couch and daybed with light grey cushions offer plenty of seating, and an asymmetrical wooden table adds a touch of natural decor. 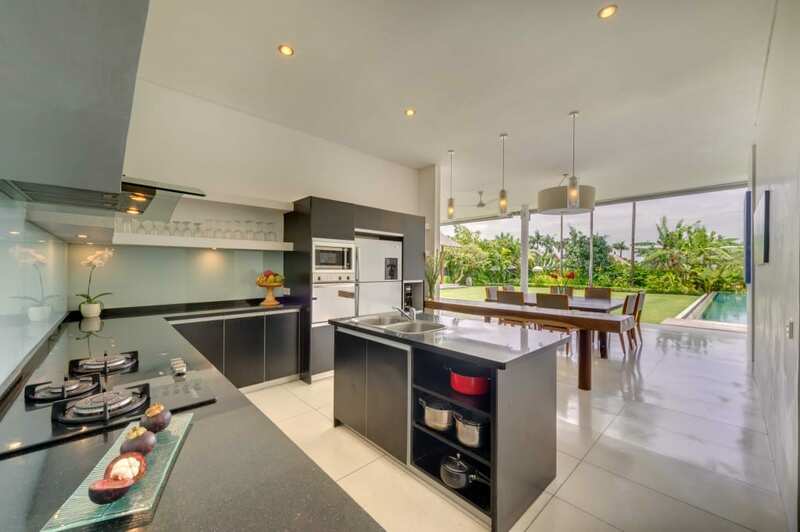 Next to the staircase, you’ll find a large open-concept kitchen with all the modern amenities you need to prepare great meals (or let the skilled chef work his magic for you), as well as a long wooden breakfast bar and a roomy table that overlooks the pool and can seat up to 8 people. 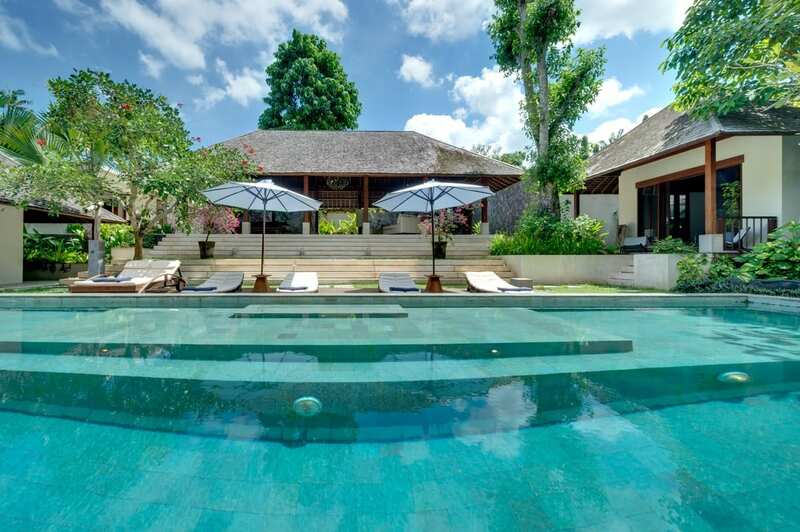 The master bedroom takes up the entire second floor of the villa and has a plush king-sized bed, a spacious wooden walk-in wardrobe and an ensuite bathroom that overlook the rice paddies surrounding the villa. 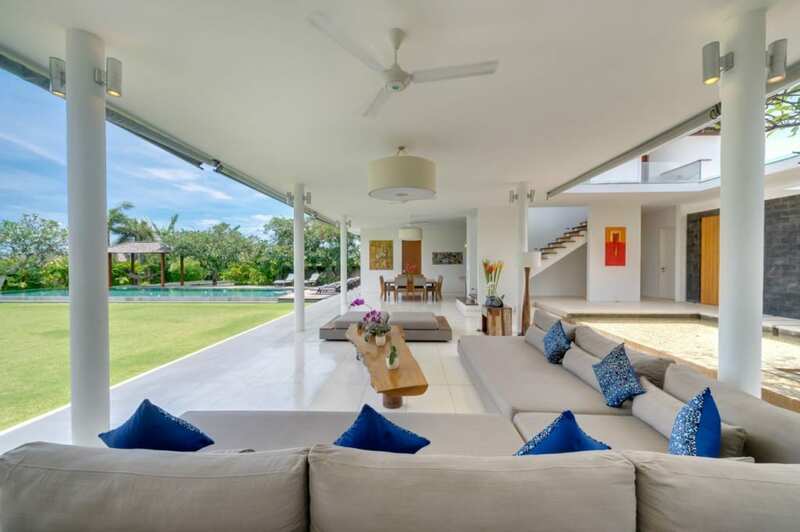 Gorgeous French doors open onto a private terrace that offers views of the garden and the pools, and you can catch glimpses of the ocean beyond the coconut trees. Downstairs and connected to the living area, you will find a breezy guest bedroom with a king-sized bed, a private terrace that spills out onto the garden, and an open-air bathroom with two washbasins, a shower, and a massive stone bathtub in a secluded courtyard for soaking under the stars. There is also a twin bedroom on this level that boasts polished wooden floors, cool contemporary shelving, a desk and an indoor bathroom. This room is ideal for kids or friends who want to share a room. 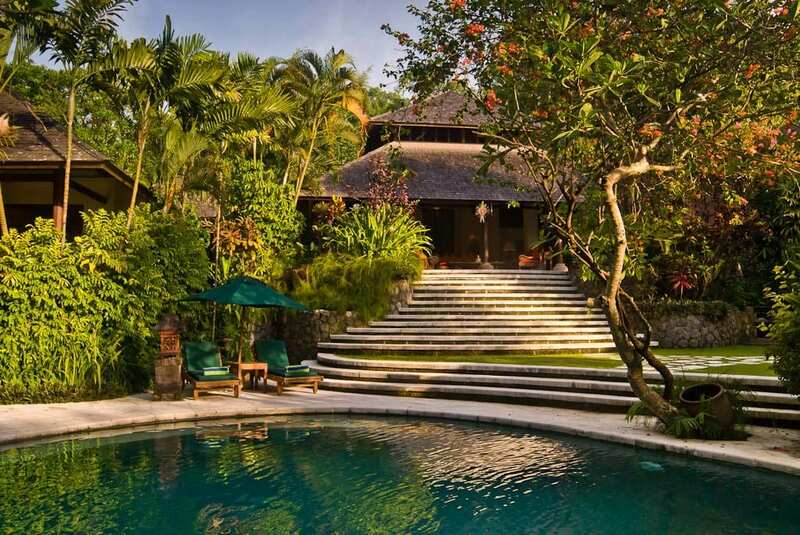 For a bit more privacy, scoop up the guest room at the front of the villa, which is separated from the living area by a peaceful lotus pond. 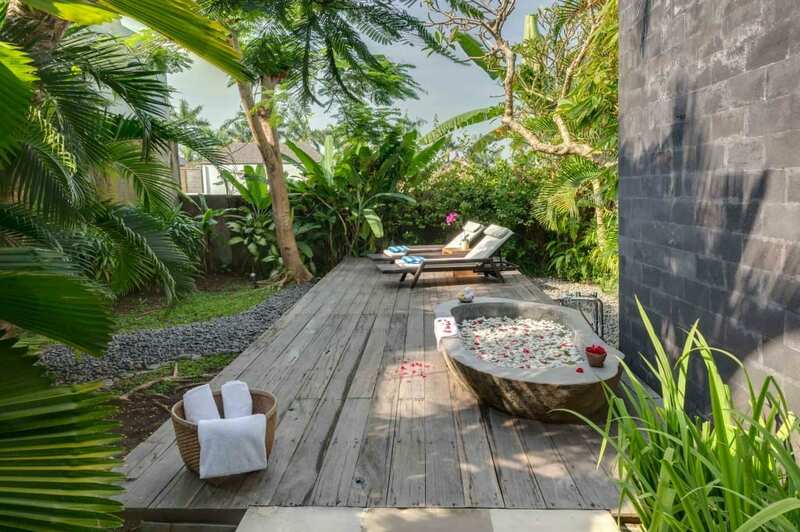 This room is quiet and romantic, with soft lighting, an inviting daybed next to the window, which is shaded by a fragrant frangipani tree, and an open-air bathroom. 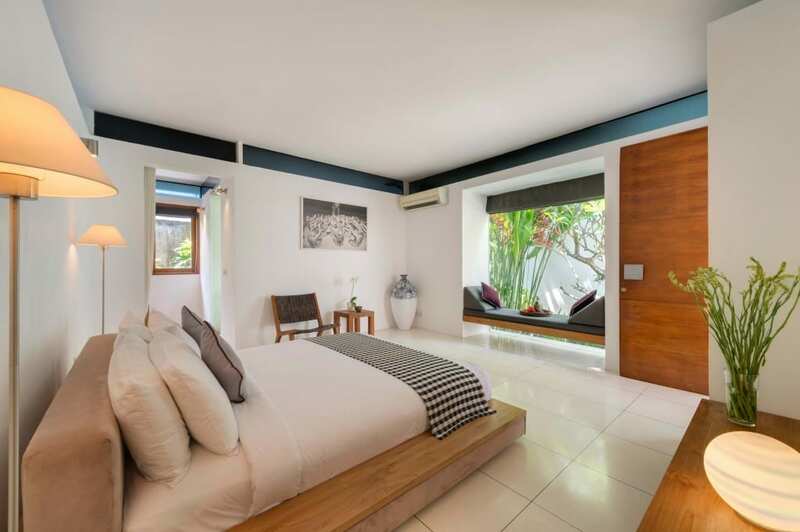 Each of the bedrooms at Villa Kavya are bright and spacious, and feature teak wood accents, crisp white linens, modern artworks and ensuite bathrooms. The bedrooms are also air-conditioned and offer modern amenities, so you have all the comforts of home and then some. Next to the kitchen and in front of the pool, there is a cozy entertainment room with a flat-screen TV and state-of-the-art stereo system. This is the ideal place to chill out in air-conditioned comfort and watch movies or entertain guests with a few drinks and good tunes. 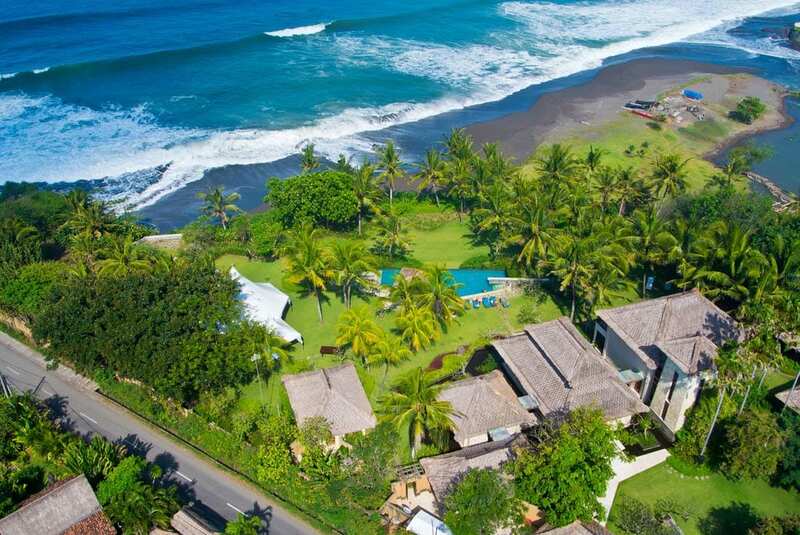 As like all of the rooms at Villa Kavya, the TV Room has complimentary Wi-Fi, so you can escape here during the heat of the day to catch up on your emails or surf the Internet. 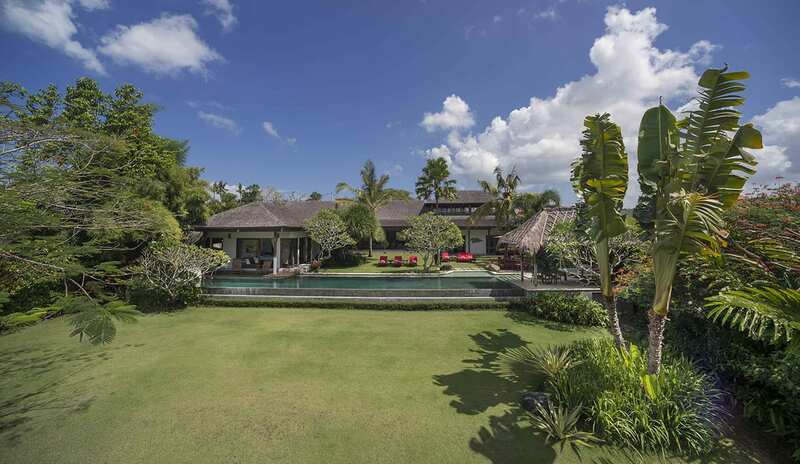 Villa Kavya offers plenty of space to get outside and enjoy the fresh air and sunshine with a large, flat lawn that is perfect for sports and games, and two swimming pools. The main pool is 17m x 5m, a decent size for doing some laps, and the smaller plunge pool is ideal for kids or those who simply want to cool off on hot days. 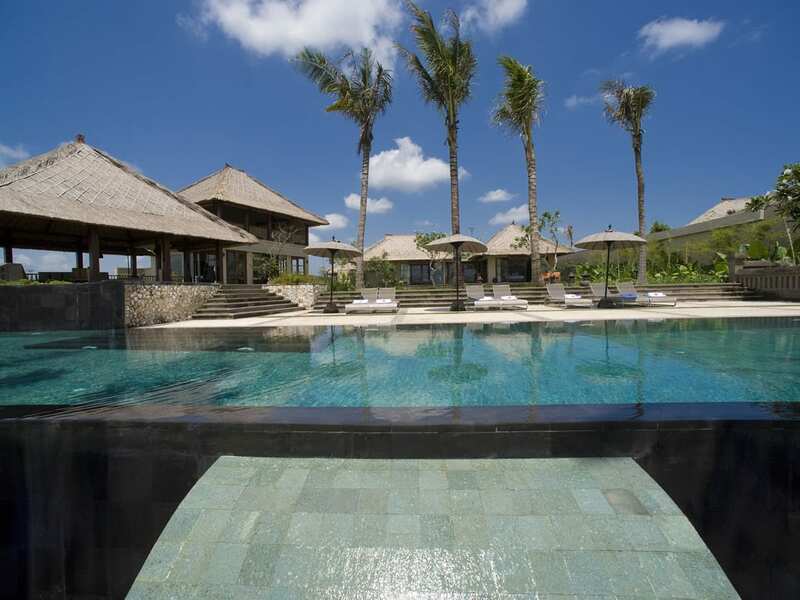 Surrounding both pools, there are wooden pool decks with long, cushioned sun loungers and tropical trees that offer cool swathes of shade. 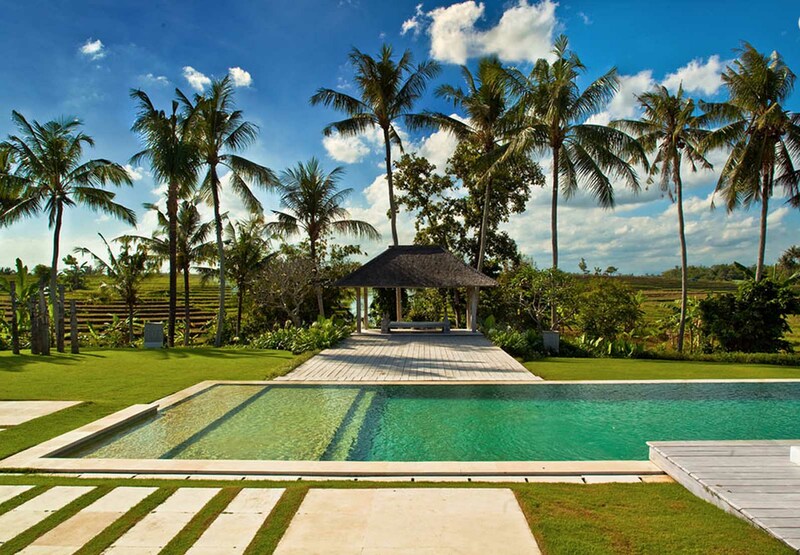 LOCATION Canggu, South West Bali, Indonesia. CAPACITY 8 guests (plus 2 children up to 12 years on extra beds, additional cost applies). LIVING AREAS Open plan living and dining area (8 guests) with ceiling fans overlooking the large garden and pool, 1 relaxation pavilion, air-conditioned TV room, poolside deck with 8 deck chairs & covered deck area with hammock. POOL 2 Swimming Pools - Main pool 15m x 5 m & Kids pool 7m x 4m (depth 0.5m). 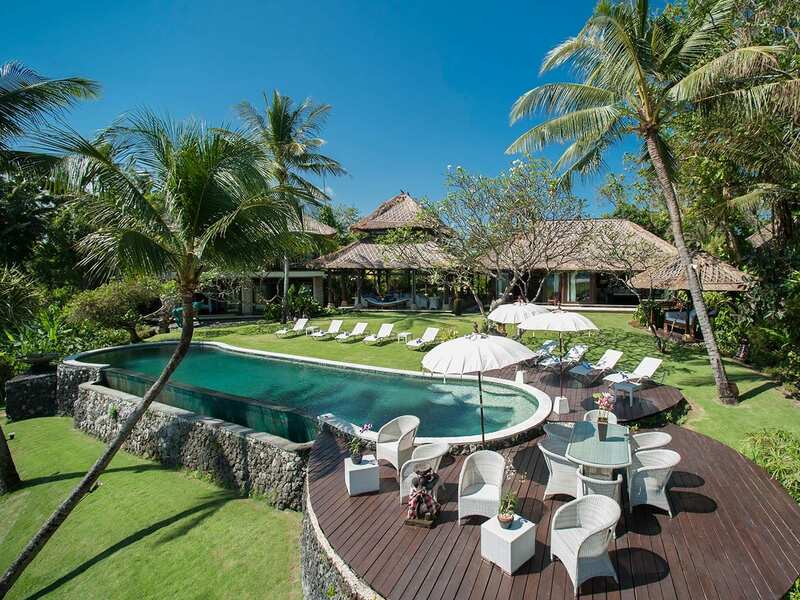 STAFF 1 chef, 2 villa attendants, night security guards, pool attendant, maintenance staff, babysitter can be booked in advance at additional cost. 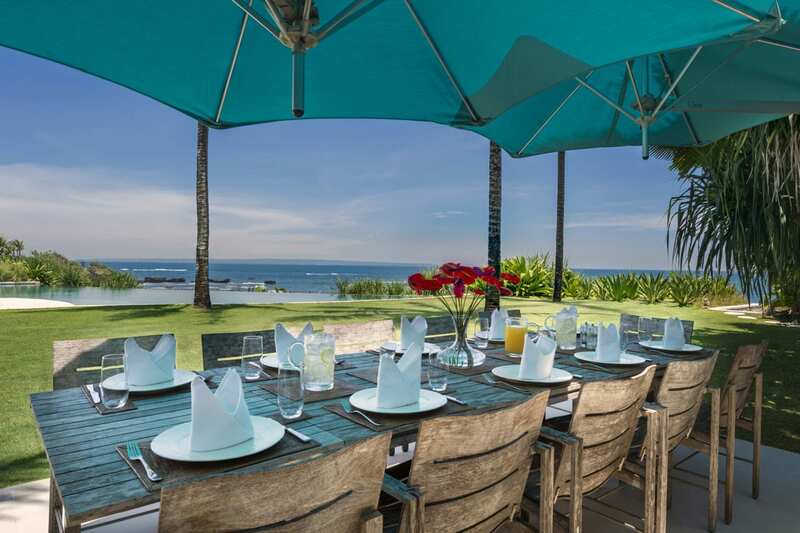 DINING Daily Continental Breakfast included in rental rate, Villa Menu with a variety of local and international dishes for lunch & dinners, all groceries charged at cost. Requests accommodated (including special diets). COMMUNICATION WiFi internet access, mobile phone coverage. ENTERTAINMENT Flat screen Cable TV with international & local channels, DVD player in TV Room, WII, IPhone/IPod connection to Living room Speakers. 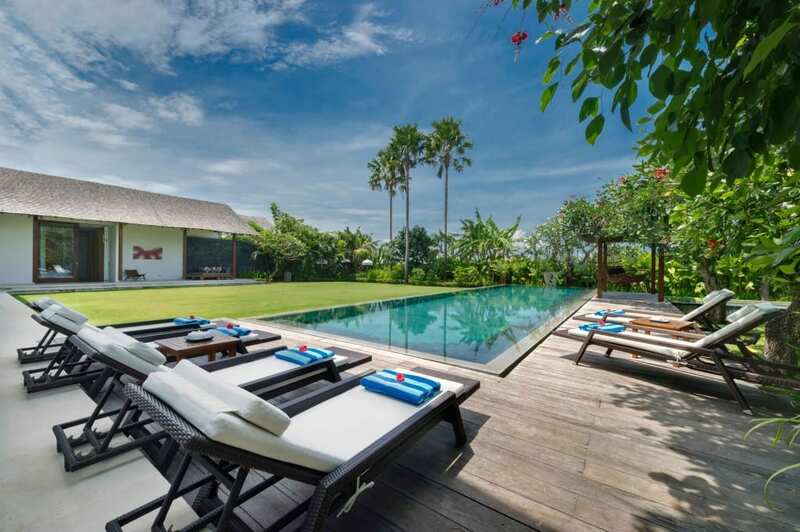 FOR FAMILIES The villa layout and the additional kids pool is ideal for families to share, there are some pool toys available, Baby Cot & High Chair & pool fence can be arranged at additional cost. EVENTS Small events up to 40 guests, for further details and event fees please enquire. From the moment we arrived at this tranquil location we knew it was going to be special. The staff were extremely helpful and welcomed us like family. 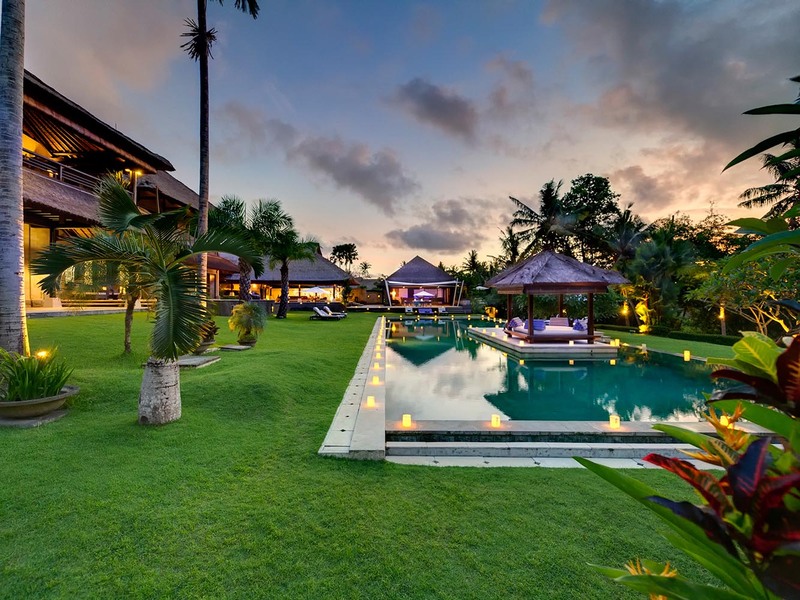 The sprawling villa is extremely impressive and very hard to leave. 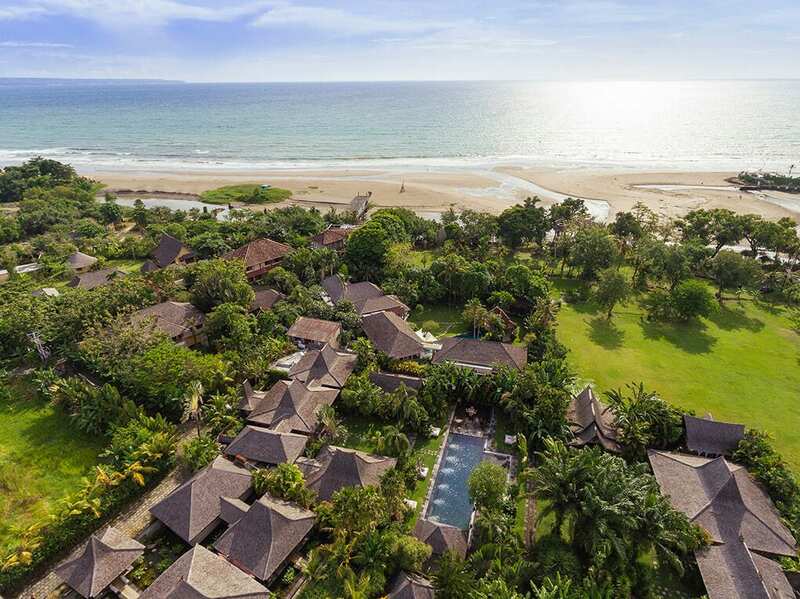 Being only ten minutes away from the buzzing streets of Seminyak was perfect as we felt relaxed, but close enough to head to the shops for some retail therapy. 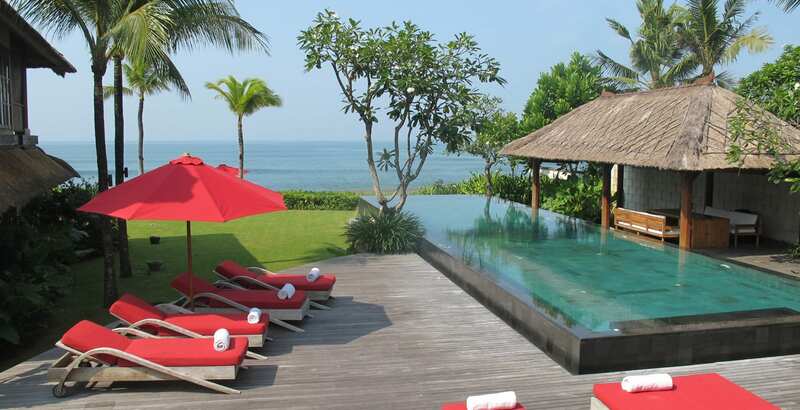 Perfect for families and friends who want to relax and enjoy the best Bali has to offer. The bedrooms are all wonderful and the outdoor bathrooms divine. 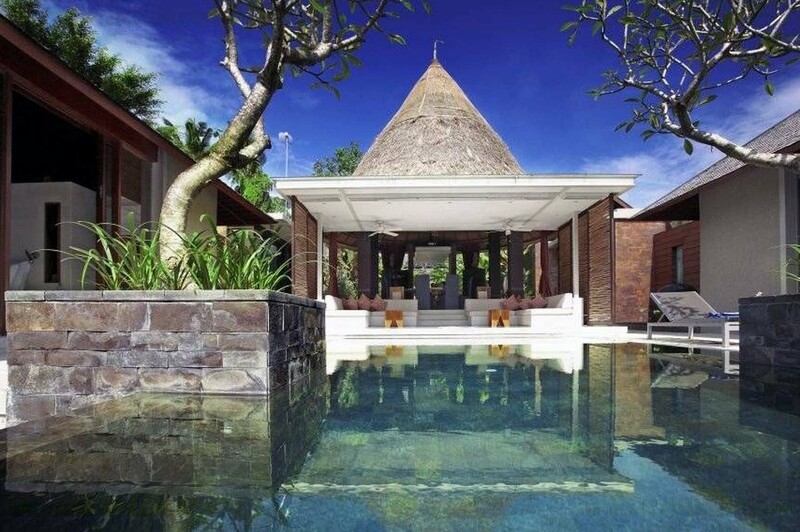 I would recommend this villa to everyone and anyone and will be back soon. The only negative is that we had the villa for the first week of our holiday and that the next hotel we stayed at was never going to live up to the "Villa Kavya experience". Thank you to all of the wonderful staff including Gusti to the incredible chef and Bagus, Wayan the driver who was extremely accommodating and helpful and the lovely Melan. Sorry if I missed anyone. 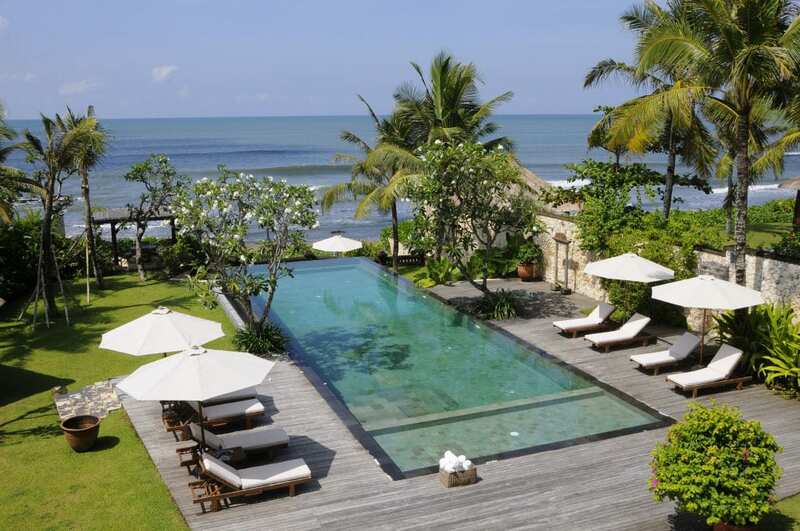 Thanks for making our holiday at Villa Kavya a wonderful experience. The villa is amazing, very generous bedrooms, the extra special master bedroom with a 4 post bed and a balcony where we enjoyed the sunsets while sipping cocktails! 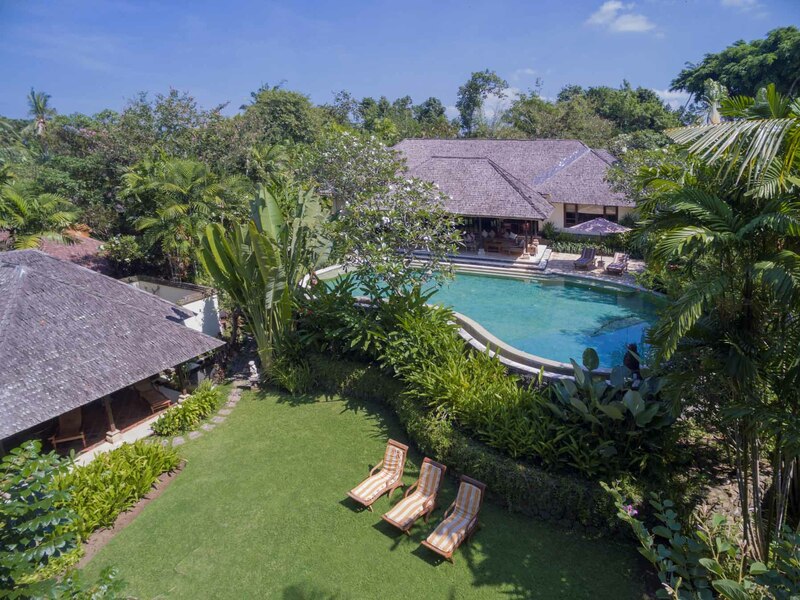 The surroundings are just so beautiful and relaxing, the pool and garden setting, there is everything you could ever want, yet if you did want to get around everything was close by, the shops and markets just a few minutes’ drive away. The staff are friendly, caring and attentive to all our needs. We had wonderful breakfasts and dinners in the house, the chef Baggus was happy to cook whatever we could possibly wish for! We had the best time and would like to thank the staff for taking such good care of us.